Extracurricular Activities : Dance and Music. Art and Design. Sports: Kabaddi, Cricket. Competitions on District level. 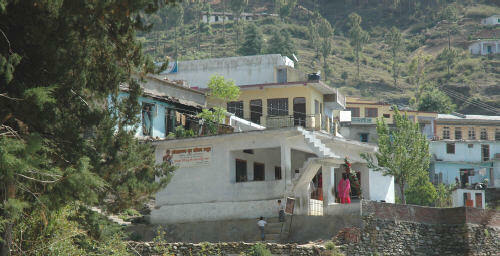 The village Thalisain belongs to Pauri District. It is situated at an altitude of ca. 1700 metres, 70 km East from Pauri, on the Pauri-Moradabad Road, 4 hours drive from Pauri. An important pilgrim place in this area is the Hanseshwar Mahadev Mandir, which is blessed with a natural Shivalingam. 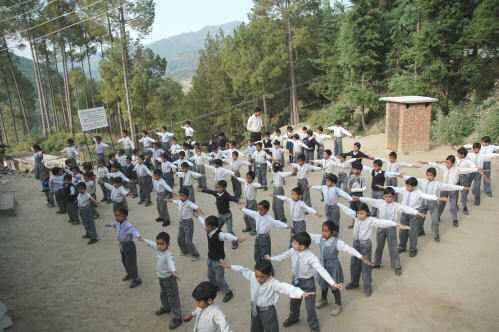 The Omkarananda Doon Public School is located in the middle of the village, with a beautiful view on the Himalayan range of the Garhwal and Kumaon regions. This School was founded in August 1997 and it is developing very nicely since then. 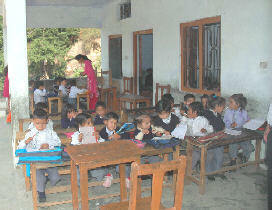 Students come to this School from as far as 9 km radius by bus from 22 other villages. It is worth to mention, that this School has got a most wonderful and dedicated Manager and Principal, Shri Bhawan Singh Rawat ("Sharmila"), who is a constant inspiration to staff and students. He himself is an accomplished poet for Garhwali songs and a talented musician. He wrote and published a beautiful book "Raibar Garhwali Lok Geet" with precious Garhwali songs, which he dedicated to Swami Omkarananda. Because of his charismatic personality the Arts, specially Garhwali and Hindi songs and dances, painting, design etc. are very much promoted among the students in this Omkarananda School in Thalisain. The children of this School are encouraged in cultural education and sports and they are very successfully taking part on District level in various competitions. Many students of this School also excel in their studies. Many former students of this School have now obtained University Degrees, which would have been difficult for them, if this Omkarananda School would not have given them a good education. The Principal of the Omkarananda Doon Public School Thalisain, Shri Bhawan Singh Rawat, accompanies the song of the students on Harmonium.